Hard Hat is engineered to help provide extended comfort, head protection, balance and stability. The lightweight design features a replaceable brow pad and unique design to the top of the hat with a short brim for better upward visibility. A four point ratchet suspension system with height adjustment delivers the balance and stability you need in demanding work environments. Accessory slots accommodate 3Ms cap mounted earmuffs, headgear, face shields and welding helmets all sold separately. 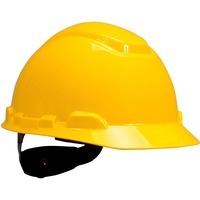 Hard hat meets the requirements of ANSIISEA Z89.1 2009 Type I, Class C.